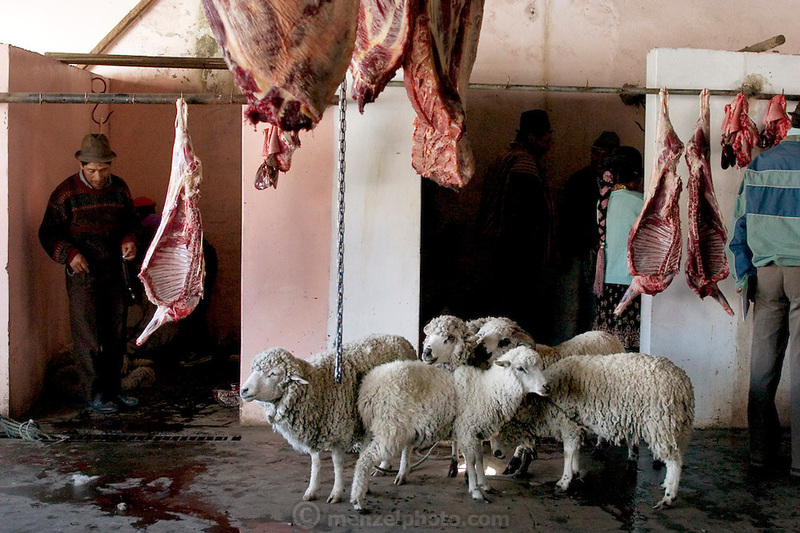 Standing beneath hanging sheep carcasses, five sheep wait patiently; soon it will be their turn at the slaughterhouse, which is attached to the Zumbagua market in Ecuador. At the live-animal market a quarter mile away, shoppers can pick out the animals they want, then have them killed, skinned, and cleaned. The entire process, including the time it takes to walk the sheep from the market to the slaughterhouse, takes less than an hour. Hungry Planet: What the World Eats (p. 113).